Qorvo is making 5G deployment a reality and supporting the growth of mobile data with a broad range of RF connectivity solutions. 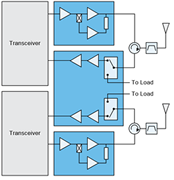 Our robust RF portfolio for both wireless infrastructure and mobile devices include PAs, phase shifters, switches, integrated modules and other high-performance RF solutions. 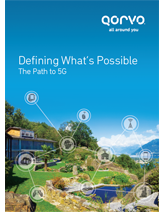 View our 5G infrastructure and 5G mobile products. Qorvo 5G Solutions Continue to Transform the World. 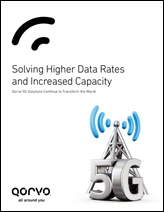 Download our 5G infrastructure products brochure to solve your higher data rates and increased capacity challenges. 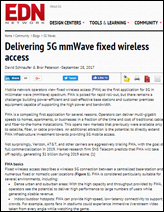 reaching into frequencies never previously thought of for mobile wireless — above 3.4 GHz, and even to 30 GHz and beyond. for streaming data, taking full advantage of carrier aggregation and massive MIMO. giving more choices to get 1 Gb/s connections to your home and business. using beam steering and high-power GaN, based on the technologies in phased-array antennas for defense. for real-time connections enabling autonomous vehicles and augmented/virtual reality. connecting more than a trillion devices to the internet in the next 10 years. Qorvo is the standard setter — participating in standards bodies and partnering with wireless carriers — to define 5G RF for the future. 5G will start as an overlay of the 4G LTE network. The 5G radio specification (called 5G NR for "new radio") will have both Non-Standalone (NSA) and Standalone (SA) operation. NSA is an evolutionary step for carriers to offer 5G services without building out a 5G core network, until they add the full SA 5G core later. 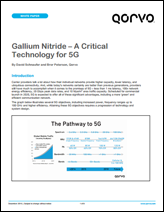 Starting in 2019, 5G will encompass major new capabilities. Qorvo connects RF for all 5G use cases — more than just cellular and Wi-Fi. 5G will overlay the 4G LTE network in the coming years. The RF function, frequency band, power level and other performance requirements determine which semiconductor technology is the best fit. 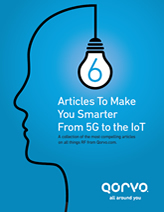 Qorvo is at the forefront of the 5G connected world. Our highly integrated devices deliver what’s needed for solutions to connect people, places and things faster, and more reliably. Our integrated products combine multiple functions into a single package, for a wide variety of applications. 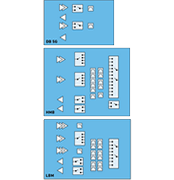 Qorvo offers a wide range of GaAs and GaN discrete transistors, available in die and packaged form. 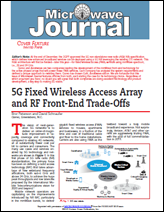 Visit our Design Hub for more white papers, articles, e-books, videos and blog posts on 5G. Read the latest news and information from Qorvo. Learn how Qorvo has pioneered and honed many industry-leading processes and technologies for three decades. Explore our growing library of resources, including design tools, videos, blog posts, brochures, articles and white papers, to help you with your product designs.